Many people skip their workouts because of the heat, the sweat and a sticky feeling after a gym workout, especially in summer. How would you feel about being able to avoid all these and still be able to gain maximum benefits from these exercises? How about jumping into a pool and reaping some benefits while having fun? Low Impact: Water exercise makes you feel 90% lighter, making it the ideal exercise for people with joint problems. It is also ideal for pregnant women. Calorie Burn: The calorie burnt in 30 minutes of water exercise is around 300 calories compared to around 200 calories burnt in land exercises. 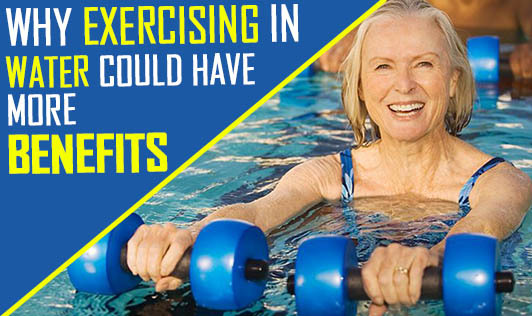 This is because water exercises require more effort due to the resistance that water provides. Mental Health: Water exercises have been found to improve mood. It can decrease anxiety, depression and increase positivity. Strength: Since water provides resistance, muscles get worked and strengthened giving it a nice, toned look! Old Age: It can benefit older adults by improving the quality of life and decreasing disability. Movement: Since there is an absence of gravity acting on the joints in water, a wide range of movements are possible which makes you flexible. Water also provides support to your body and prevents you from falling. Keeps you Cool: A major advantage of water exercise is that it keeps you cool and prevents excessive sweating. This will keep you from getting dehydrated excessively. The areas around the pool can be slippery. So, be careful when you walk. Do not overdo your exercises. Talk to your physician before starting anything new. Do not perform all your land exercises in water. Discuss with your physiotherapist about safe exercises which can be done. Do not go to the deep end of the pool. Always make sure there is a lifeguard around. Make it a group activity. You could join a class or make it a family activity once a week. Since your body is cool, it is easy to forget to drink water. Make it a point to keep yourself hydrated.